Petrus is the world’s benchmark for 100% Merlot based wines; it is peerless in Bordeaux, however it now has real global competition from Italy’s world famous Masseto. Masseto is both rarer and offers better relative value; producing a meagre 2,000 cases a year against Petrus’ 5,000. Over the last 5 years Masseto has marginally bettered Petrus for quality, averaging 96.3 points against Petrus’ 96.1 from Robert Parker’s Wine Advocate. Petrus’ current average case price (per 12×75) is £19,000, while Masseto’s is £4,500. Masseto leads Italy in Liv-ex’s Power 100 at number 11, ahead of Chateaux Margaux and Haut Brion. This is hardly surprising when we consider it has increased in value by 110% over the last 5 years and therefore, represents one of the best investments in the fine wine market. The success story of this year has been the Super Tuscan 2010 vintage hailed by the leading world Italy critic, Antonio Galloni ‘In my view, 2010 will go down as one of the great all-time vintages in Tuscany.’ Masseto is the highest scoring wine of the vintage and the most sought after. Super Tuscan wines are sold on a strict allocation basis and global demand for these leading wines is great, led by America and Europe, leaving very little surplus every year. This year China began to join the market with great verve and Masseto in particular is a favourite in Eastern Europe. Masseto is released on the Place de Bordeaux through negociants and merchant allocations are minuscule, leading to immediate price increases overnight if one can get a case at release price. 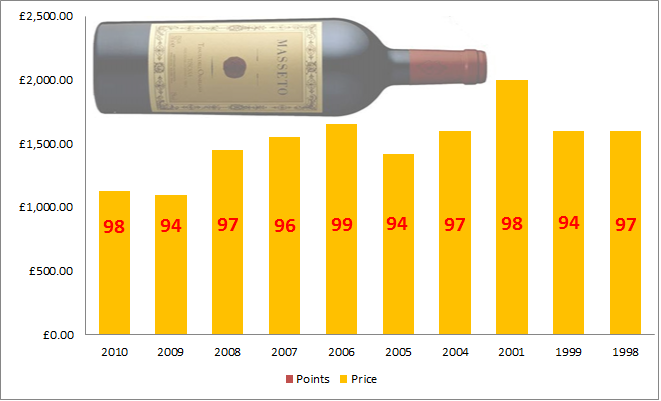 The 94+ point scoring 2009 was released below £800 for a 3 bottle case and now trades above £1,100, which still looks undervalued given that the average case price (3×75) from 1998 to 2008 is £1,748. Masseto 2010 has been one of the most highly anticipated releases this year and we have sourced a second parcel available at the lowest listed marketprice of £1,100. Masseto 2010 received 98 points from Galloni and his replacement at the Wine Advocate, Monica Larner, making it the second highest ever scoring Masseto. The major Super Tuscan estates continue to offer discounts on release, providing buyers with an incentive to purchase wines early in their lifecycle. We believe that Masseto 2010’s natural price level over the next 12 months is £1,400 and it will rise to £1,600 within the next 30 months. Masseto is located on the Tuscan coast in Bolgheri and was established by the Antinori Family, who are also responsible for Ornellaia. Masseto is a paragon of wine making, found on the hill of Masseto, which is about 120 metres above sea level. Again like Petrus, its clay terroir allows the soil to absorb and store water, aided further by the sea breeze keeping the terrain perennially cool. This allows the grapes to grow steadily, without stress, ripening fully under the warm Tuscan sun, thus facilitating the ideal harmony of sugar and polyphenol ripeness.